US sanctions against North Korea: What are they? 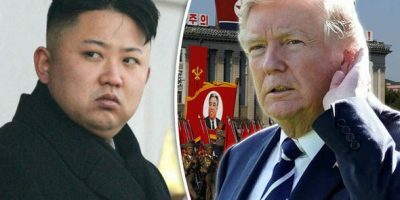 President Trump told The Wall Street Journal in an interview published Thursday that “I probably have a very good relationship” with North Korean dictator Kim Jong Un, potentially opening the door to diplomacy with the rogue nation. The comments to The Journal echoed remarks Trump made to reporters over the weekend at Camp David, in which the president said that dialogue with Pyongyang was not impossible. The rogue regime and South Korea hope to ease tensions. “I always believe in talking,” Trump said Saturday. “Absolutely I would do that, I wouldn’t have a problem with that at all.” The president later added that any discussions with North Korea would be accompanied by unspecified conditions. The U.S. has not had formal negotiations with North Korea on its nuclear program since 2012. It has, however, retained back-channel communications through the North’s diplomatic mission at the United Nations in New York. The president’s remarks come after North and South Korea this week held their first talks in two years, and the North agreed to participate in the Winter Olympics in the South next month. Jerry Seib, executive Washington editor for The Wall Street Journal, says landmark talks between North and South Korea may have gone well, but it’s still early. Trump claimed credit Wednesday for the inter-Korean dialogue, saying North Korea was feeling the pressure of a U.S.-led campaign of sanctions over its nuclear weapons and missile development. Last week, the White House agreed to delay joint military exercises with South Korea until after the Olympics. Defense Secretary Jim Mattis insisted the move was a practical necessity to accommodate the Olympics and was not a political gesture. Lt. Col. Michael Waltz reacts to remarks from South Korean President Moon Jae-in. In the Journal interview, Trump framed his past comments as part of a strategy. Greg Palkot reports from Seoul on the issues discussed during 11-hour meeting. A White House statement said the two leaders discussed Macron’s recent visit to China and committed to continue to apply pressure on North Korea.